When playing music at home, you want good sound quality. You may as well add in a smart assistant and make it hands free! Check out these speakers. 47 million adults have a smart speaker in their home, so why don’t you? You may have assumed that these were going to be a fast fading trend, but they are quickly becoming mainstays in people’s homes. From controlling your thermostat, checking the weather, to making video calls, these smart assistants aren’t just capable of playing music – they offer tons of other features as well. If you’re a musician, you may not have thought about the benefits of a smart speaker with assistive technology. There is no longer a need to chain yourself to your desk where your home recording setup lives. Break free with these smart speakers. 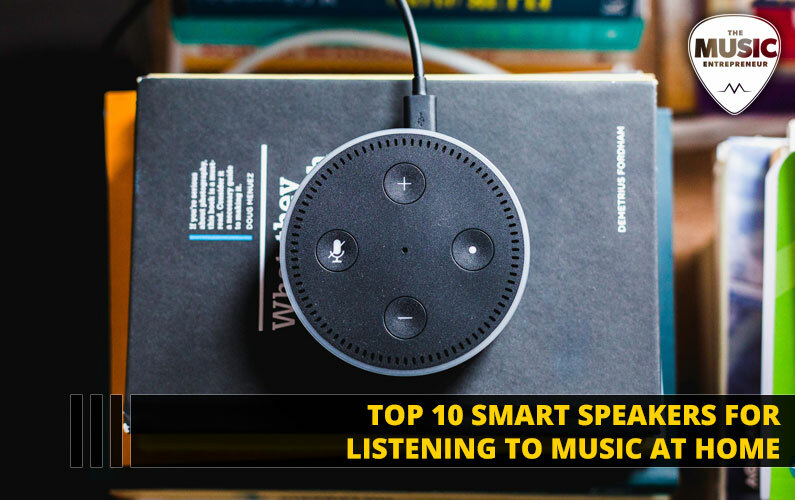 By far the largest smart speaker on this list and one of the largest in existence. If you want audio that doesn’t just fill the room but takes it over, this may be the smart speaker for you. While it doesn’t offer a 360-degree design like most, it’s enough power to find every corner. The device uses the Google smart assistant and costs $400. Other Google smart speakers exist with similar smart assistant functions. The Google Home Max is the clear front-runner in terms of pure sonic power. The Sonos One is a speaker with a smart assistant that won’t break the bank. Alexa is at your command as the voice-activated home assistant and can control your apps, music, and answer questions. Starting at $199.99, this is a simple device that can play your own recorded music anywhere in your house. The Sonos One also contains an ethernet port, allowing you to use a stable internet connection and not worry about troublesome Wi-Fi. Lenovo takes the potential of smart assistant devices to another level. The display makes this device stand out from the rest. Perfect for a kitchen or any room where access to a screen can come in handy, the Lenovo smart speaker lets you play your music while taking care of household needs such as cooking and cleaning. Starting at $179.99, this is more than a standard home voice-activated speaker and comes at an attractive price. Make video calls, browse the internet, and watch videos all on one device. The only device to use Apple’s Siri smart assistant, the HomePod is the go-to for Apple users. The HomePod costs $349.99 and connects seamlessly with Apple apps and communicates with Apple devices easily. This smart speaker has high-quality audio and uses the popular 360-degree design to fill the room with sound. If you already use Apple products to create your music, this may be the device for you. The Echo is not just one device – it is many. The Echo is one of the most widely known smart speakers. Amazon’s flagship entry into the smart assistant market uses their own Alexa and comes in a wide variety of shapes and sizes to fit your needs. The high sound quality, which you can read more about in this article, and price-point make the Echo a near-perfect smart speaker. The Echo starts at $39.99. JBL is a respected name in home audio, so it only makes sense for them to offer their own home voice-activated speaker. Google assistant runs on this device and projects audio in 360-degrees. It costs $149.99, making it very competitive in the home voice-activated speaker market. The portability of the JBL Link 20 lets you have your smart assistant in multiple rooms or even outside of your house. Maybe you can even add it to your list of things to bring to a gig. Full surround audio and the Google assistant is just the starting point of this smart speaker’s features. The standout feature is the touch-free gesture control. Waving your hand in different directions in front of the smart speaker allows you to control volume and music tracks. Another respected home audio brand, Harman Kardon has delivered a very stylish smart speaker to the market. The Invoke can be found for $99.99 or less and offers great audio for the price. The only smart speaker in this list to run Microsoft’s Cortana smart assistant, it may not meet the same level of user-friendliness as the others, but it will handle your music without issue. Is this the most unique smart speaker? Possibly. If you’re a musician, then there’s a good chance you’re familiar with Marshall amplifiers. Even non-musicians have seen them on stage at live concerts. The Marshall Stanmore takes the beautiful Marshall design and packs full smart assistant functionality into it. It starts at $399.99. The Marshall smart assistant is Alexa, ready to answer all of your requests. The ability to fine-tune your audio settings either from the device itself or from a Bluetooth connected phone makes this a fine device for musicians that want to listen to their own recorded music at home. Finishing the list is the smart speaker for active people. Need to take your recorded music with you to play in music venues or maybe for a large group of people? This smart speaker is for you. The Ultimate Ears Blast was made with portability in mind. It is waterproof and boasts a long-lasting battery that will give you plenty of time between charges. Alexa runs on this device, and it will cost you $179.99. There are many ways to listen to your music at home, but smart speakers are the only devices that can do it while also providing personalized assistance. There’s no reason to interrupt your working session with a trip to the kitchen for a cup of coffee. Smart assistants give you creativity and freedom to work on your projects while controlling your music and moving around your house. And, while you’re here, take a look at other ways you can improve your career as a musician or home recording artist.